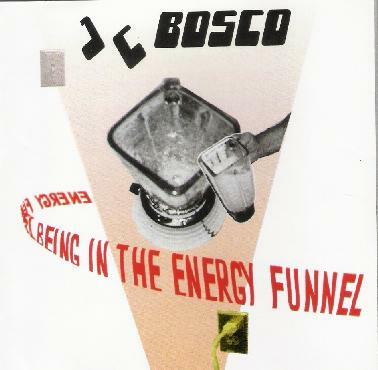 J.C. Bosco - "Being In The Energy Funnel"
It's been almost 9 years since the first J.C. Bosco album - A Positive Flow. The band is the brainchild of New York City musician and songwriter Joshua Charles, and on his new album, Being In The Energy Funnel, Josh is back with more of his progressive influenced brand of pop music. Songs like "Jigsaw Lady", "For Cecille", "Passing The Time" and "Hear (Part 2)" are catchy prog-pop tunes that are very much in the spirit of his A Positive Flow album. Other highlights include "Mofungo", with its jazzy rockin' rumba grooves. "Rubberella Stella" is a very Zappa inspired song, though still retains the Bosco sound. At nearly 8 minutes, "In Some Laughs / Energy" is the longest track of the set. It starts off with a freaky intro before getting into the main song portion. Josh does a stellar job of retaining the song quality throughout, while backing it with music that is complex yet doesn't overshadow the "song". And after restraining themselves on this song, the band bust out a bit more on the instrumental "Take Flight", a cool funky prog-jazz jam tune. Josh really lets his hair down on "Bees 'N Chocolate", a combination of fun-with-sounds and free-wheeling acoustic melodic playfulness. "They Danced" is similar", and another example of Josh's flair for backing melodic accessible songs with sophisticated yet unpretentious music. And the album closes with the spaced out rap and hip-hop number, "That's A Wrap". It's interesting to reread my review of A Positive Flow nearly 8 years ago where I noted that it's difficult to pinpoint a trademark Bosco sound. Yet having heard the album over these past several years and now the new one I have to say there is indeed an identifiable Bosco sound, in terms of song structure, writing style and Josh's recognizable singing voice. And while Being In The Energy Funnel very much picks up right where A Positive Flow left off, the new album is more overtly progressive rock influenced than its predecessor. No need to be afraid of "pop" music folks. It CAN be interesting and adventurous. Hope we don't have to wait another decade for Josh's next album. For more information you can visit the J.C. Bosco web site at: http://www.myspace.com/jcbosco. Purchase Being In The Energy Funnel at CD Baby: http://cdbaby.com/cd/jcbosco2.